Ike Jonathan Awgu is a lawyer with offices in Toronto and Ottawa. He has written editorial columns for the Ottawa Sun, the Globe and Mail and hosted a national television show on the the Cable Public Affairs Channel (CPAC). He is also a frequent guest on Huffpost Live. Both the housing dilemma and the rental dilemma - two problems connected at the hip - have the same solution: an increase in supply. And in time, so long as there is no government interference designed to spare the market from bubbles that grow too large and pop on their own, the system will re-balance and recover. The new technological revolution has created millions of jobs (and that's great!) -- but jobs for who? There is an that assumption that the 'new jobs' which spring from the ashes of the industries they've replaced will be of such a character that the people previously employed as long haul truck drivers or fast food employees will find new employment. The technological revolution is different; the industrial revolution took years to replace entire industries. This one takes months. The government of B.C. 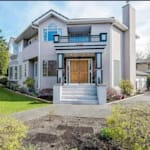 's decision to impose a 15 per cent hike in Land Transfer Taxes for foreigners who buy real estate in metro Vancouver will do almost nothing to lower high housing prices. It will, however, generate even more money for a government that has already profited enormously from foreign nationals. A money launderer and wealthy entrepreneur from abroad may both be considered "Foreign Investors" with similarly disparate outcomes. A great deal of the former (money launderers) are infiltrating a porous Canadian financial system to purchase real estate in Vancouver and Toronto and have contributed to the out of control housing prices in both cities. Who do Canadians trust to shepherd our country though what may be a coming turbulence? Our current election sees once more a plethora of "Star candidates" that normal Canadians know nothing about -- and their victory or defeat will have nothing to do with the very little light that these stars emit. When the United States retreats, there is a world of instability, where civil wars in strategic regions, violence, danger and death are ever more present. The world looks much like it did before the United States emerged as a global superpower. Sunday, June 15 is Father's Day -- the one day of the year when the mainstream media and much of the public pretend to actually value fatherhood and the role of a father in the modern family. For the remaining 364 days, the role of fathers in the family is discounted, downplayed, taken for granted or seen as optional. Fathers are attacked by a court system that unfairly and disproportionately refuses them custody of their children. Attacked by the media that all too often, and wildly out of proportion to reality, portrays them as bumbling, villainous or incompetent. The Toronto Star and other publications have touted the success of Ontario's Africentric school system. The problem is, one would expect higher test scores and improved behaviour from students who attend such a school, as the program will self-select parents who care more about their children and are engaged in their education. The fact is, as confirmed in countless studies, that the collapse of the black family within a segment of the black community is the primary reason so many of our children fall through the cracks of society, to be broken against the hard, unbending steel of racism, prejudice, failure and depression. No amount of "specialty schools" can change that. Is It Possible That Rob Ford Is Actually a Great Mayor? What if one of the reasons Toronto is so prosperous is precisely because its Mayor is too befuddled and unimaginative to interfere in any serious way with the functioning of the city? What if Mayor Ford is great precisely because he does little to nothing? I'm a little tired of hearing about blackface costumes and how I should be offended by people who are obviously not racists. Context matters. Intentions matter. If a group of white dudes decide to dress up as a black-skinned Jamaican bobsled team, should I be offended? Why, because they aren't 'black' Jamaicans? Jamaica is a multi-racial country. I was at a bar once and this exact thing happened; I felt as thought I "had" to be offended even though, really, I didn't care and thought it was a funny costume. Perhaps in the new age, we need to find a term aside from "racist" to describe behaviour that is simply racially insensitive or stupid. Yesterday I had the bizarre experience of reading an article in the New York Times purportedly written by Vladimir Putin. I suspect that the article I read was a cleverly disguised satirical piece -- Mr. Putin was not trying to be serious, he was trying to prove that in addition to a master statesman, bear hunter and judo expert, is also master of the ever elusive art of ironic humor. For example, he admonishes the United States for claiming to be "exceptional" and writes "God created us equal." An interesting and laudable notion, but clearly Mr. Putin does not himself believe this applies to those of us created gay. When did Americans decide to appoint Edward Snowden vanguard of their privacy and safety? Snowden has done more than tell his countrymen about their government listening to a few phone calls; he has gone abroad and given the information to foreign governments. The "big three" as I call them (the intolerant, the anti-intellectual and the undesirable) began to migrate to the GOP in significant numbers in 2008. These folks have remained in the party ever since, pushing it closer to their political agenda and off a political cliff. This is one American phenomenon that there should be no interest in embracing. By now most of you are familiar with the tragic Valentine's day killing of Reeva Steenkamp by Oscar Pistorius, South Africa's famed "Blade Runner." Pistorius's claim that he mistook Reeva Steenkamp for a burglar, shooting her through a bathroom door, has left me full of questions. He knew that his girlfriend was in the house -- she had fallen asleep in the bed beside him. Why then he did not first assume what seems most rational -- that it was his girlfriend in the bathroom making the noise? Why didn't he verify that his girlfriend was not safe in bed beside him? Or even turn on a single light? Christopher Dorner is a canary in a coal mine in that his story is a warning for the officials who appear poorly prepared for the very real threat of domestic terrorism. Dorner is dead and gone but he is a warning of far more serious problems that must be dealt with. We ignore this canary at our own peril. On Tuesday January 29, 15-year-old Hadiya Pendleton, an honour student who had just performed at President Obama's inauguration, was gunned down in a Chicago park. Hadiya was described by her father as a "shining light", and she dreamed of becoming a lawyer. This brings the number of gun deaths in Chicago since the New Year to 42 -- the deadliest January for the city in 10 years. This is not just a black problem. It's a family structure problem. When it comes to handgun violence in places like Chicago, marriage and fathers are the answer. Supriya Dwivedi wrote an interesting column titled, "Why Hillary Clinton Can't Act Like a Man." In it she complained of the prejudicial treatment women endure at the hands of a sexist media. This is all of course at least partially true, but in an attempt to be different, let's consider: Why a Man Can't Act Like Hillary Clinton. Double standards swing both ways. President Obama will be making a public address on Wednesday to discuss the recommendations brought forward by Vice President Biden's task force on gun violence. Many suspect that a new ban on assault weapons will be part of his proposal. If so, be prepared for the fix that will fix nothing. And make no mistake, the President knows it. The problem with bans is that supply and demand is smarter than government -- so long as sufficient people desire assault rifles a ban on assault rifles will enjoy the same success as the bans on marijuana, cocaine and handguns enjoy currently enjoy.